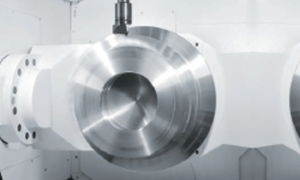 The series falls within Mazak’s DONE IN ONE® concept by incorporating all processes from raw material input through final machining in just one machine. As such, the VARIAXIS machines reduce production lead times, improve machining accuracy and lower operating expenses. 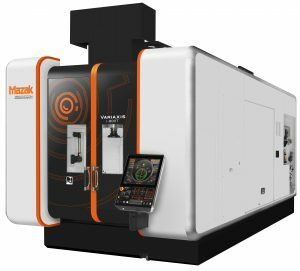 Mazak’s highly advanced MATRIX 2 CNC control brings increased ease of operation to these machines. Enhanced hardware and software functionalities within the control make it easy to use while also delivering high accuracy and increased productivity. Control hardware performance is much faster with higher processing speeds for small increment operation. Furthermore, a 5-axis spline interpolation function included in the control’s software provides smooth toolpaths from long block-by-block programs, easy tool vector control and shorter cycle times as well as superior surface finishes. 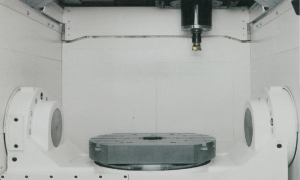 The rotary table (C-axis) is driven by a direct drive motor for both C-axis positioning and turning operation with a maximum spindle speed of 1100 rpm. Turning is performed with the A-axis in the 0 degree position or 90 degree position. 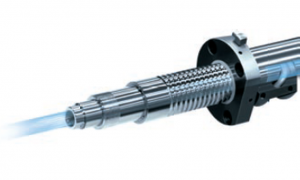 Since the A-axis is rigidly clamped on a coupling in the 0 or 90 degree position for turning operations, high accuracy machining over extended periods of operation is ensured.